Limited Lifetime Scroll down to see compatible models. Please, make sure your Mac supports 8GB DDR3 1600MHz speed ram into one slot. Finding compatibility: On your Mac screen find and click Apple icon located in left hand side upper corner and chose " About this Mac ". Click " More info ". In the Contents section on the left side of the screen, click " Memory " See memory type and memory speed- MAKE SURE, YOURS IS DDR3, 1600MHz. Your Mac must support 8GB ram into one slot. Contact us with your Mac details, if you not sure before you buy this product. Basically, I cant tell the difference between this and any of the more expensive modules. It works, its fast and its cheap. Win all round. Pamieci super. Szybko, tanio i solidnie. Firma nie znana ale po rozbudowie sprzet dostal skrzydel. Zamienilem cztery GB na szesnascie i naprawde widac roznice. The heat-spreader plates added to these SODIMMs add just enough extra bulk to prevent them fitting the slots in some PCs where they fit literally one on top of the other. In that situation, the respective modules could easily be in mutual contact via the heat-spreaders and that would make it difficult for the chips to cool. That is the problem with my own PC and I have therefore needed to return them for an alternative product. For those PCs where they fit either end-to-end or side-by-side there may not be a problem provided that there is the needed tolerance for their additional bulk. Looked around, this memory was the cheapest by far and I was uncertian if it would work in my 2011 MacBook Pro, but knew I'd be covered if anything went wrong. Came packaged like every other memory module I've purchased over the years, fitted and worked fine and still going strong. Don't have any worry s with the brand or seller and acts and behaves just like any other name brand memory module. Can't give any more so 5 was it, a little slow on the delivery, but our royal mail man is getting on in the years and I didn't choose any expedited delivery so it came within the estimated dates. Have been using RAM for couple of weeks now and it works fine. No complains. High Quality RAM Review by Mr. H. N. Lone "hlone"
Excellent Product - Seamless Results Review by Kathryn E. Goldin "katgold"
Asus N56M 16GB Laptop memory Review by DikDik "Mandala"
Received in time , almost as they said,, within 5 days! Opened my laptop, took out the old memory modules, slid in the two 8gb modules and powered the machine, voila after couple of power up, the laptop is running as smooth as the modules were factory installed! If you know your cpu e.g intel, then i recommend that you check your cpu at their and it will tell you what kind of memory and what is the max limit. Asus says max is 8gb but its not true, my laptop can accept up to 32! I recommend this product and its a hassle free installation, Good customer service. Had to send in my laptop for repair and they found out that one of the module was faulty. Contacted the komputerbay and asked they for replacement module. Waiting for their response. Aside from being incorrectly labeled they were perfect Review by Launchpad "Launchpad BS"
I bought these for my 2012 MBP, they came labeled as the 1333MHz chips but upon inserting and booting they showed as the 1600MHz I was expecting. macbook is now running @ 500 GBps. winner. Works flawlessly on Mid 2012 Macbook 15 Review by Akis C.
I was a bit hesitant before buying this ram for my Macbook, but because of the low price and the positive reviews i thought i should give it a shot. I ran Memtest twice after installation and everything appeared to be fine. I 've been using this ram for over a month now and had no problems so far. Excellent product, superb price, great service. Bought this ram for my new Mac mini and it arrived a lot faster than the mini. Didn't even start the system once without installing it first. I honestly bought this as I had no other choice. The Crucial RAM wasn't available and this seemed to be my best and cheapest option. Little did I know it was actually a pretty good choice. Once ordered, I received the next day (thanks to Amazon Prime!) and installed into my laptop (HP 8470w which came with 4GB RAM). The laptop's performance has improved and it feels much more responsive. Very decent modules(2x8GB) 1600 MHz of RAM, replaced the initial 8GB I had in my laptop, laptop and system recognized the modules without any problem, everything works flawlessly, would recommend it to everybody, delivered on time, seller is trustworthy. Works perfectly. Review by Mr. Andrew M. Brocklehurst "Mr Buys-a-lot"
Works perfectly in Mac Book Pro. Totally compatible and does what it says! Work great on my MacBook Pro Mid-2012. Very easy instal, less 5 min. received the memory pretty quickly, worked a treat on my new 27in imac 2012, no complaints. Purchased the memory to upgrade my old laptop. Memory fits perfect and works a treat. No issues with compaitability. Perfect! Review by SJP "SJP"
Initially didn't arrive so was given a full refund, thanks!. Item has now arrived and been installed in my laptop(lenovo T420) and is working like a charm :) The speed increase is very noticeable. Goods arrived within a few days, Well packaged and clearly labelled. Initially i was weary about glitches and bugs that may occur when ramping up my Macbook pro late 2012 model to have 16GB RAM. Been using it and it works fine ! boots up programs in a second and runs smoothly then ever before. The Komputerbay memory just works as advertised. No small prints, hidden information. Timings and speed exactly as described. I didn't really know what I was looking for when it came to RAM for my Mac Mini except the figures and specs that I needed. I purchased the above product on the basis of what I was told I needed. I bought it, really, because it was inexpensive compared to others and it was well reviewed. There is always a fear when you insert new RAM into you computer - will it start? Have I fitted it right? Is there some error? I needn't have worried. The whole thing, from ordering to installing and starting up was a breeze. Worked first time Review by Wanny7 "Northumbrian"
Bought this as the price was the best available. Bought an i7 Laptop from work. It had 8 GIG of RAM. It now has 24 GIG. Easy to fit, and upgraded my iMac (Mid 2011 edition) do it now has 16gb of memory. This needs almost no explanation, I got 16Gb for my mac, I was 1% worried it was too much for my mac. But it arrived early, packaged well, installation was a doddle. The RAM worked exceptionally well, I can now do alot more with my Mac. This memory upgrade worked without a problem, the installation was easy (unusually for a apple product) and worked without a hiccup. This arrived promptly, plugged in fine and "Just-Worked" would use again. I know of Komputerbay from other places but this was the first time I've bought them on Amazon and I'd happily do it again. Great Review by Telmo M.
Ive been using this memory now for approx 9 months. Absolutely stable and benchmarks as it should. This company unlike others follows up your purchase asking if you are entirely satisfied and if not may they be of any assistance. Its a breath of fresh air in comparison to multinationals which are a nightmare to deal with should you have a problem. I bought this memory as a quick replacement while i awaited that huge manufacturer Crucial to replace their faulty batch. It took almost 3 weeks , needless to say komputerbay's memory is still in situ and going strong. I had bought 8gb from KomputerBay last year - thought it may be a bit of a gamble as I hadn't heard anything about them - but the price was so good. Anyway the RAM arrived ahead of schedule and worked like a dream. So, I hadn't any hesitation in buying 16gb for my new ultrabook. Great price, only let down by slow delivery by Amazon - NOT Komputerbay's issue. 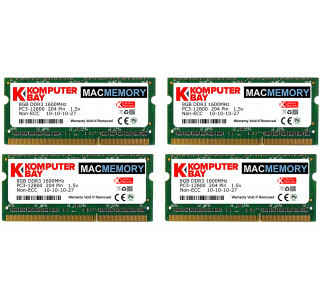 Does the job Review by C. Kranz "-ck-"
Konmputerbay RAM Review by William E. Wood "wwood168"
I have bought Komputerbey RAM chips on more than one occasion, as they offer lifetime warranty at a more reasonable price than other well know suppliers. Their RAM has always passed my MEM Test routines without failure. Bought two of these to upgrade my Early 2011 15" MacBook Pro from 4GB to 16GB - installed fairly easily, slightly thicker than standard modules so it's a snug fit. No issues being recognised by OSX, performs as expected. 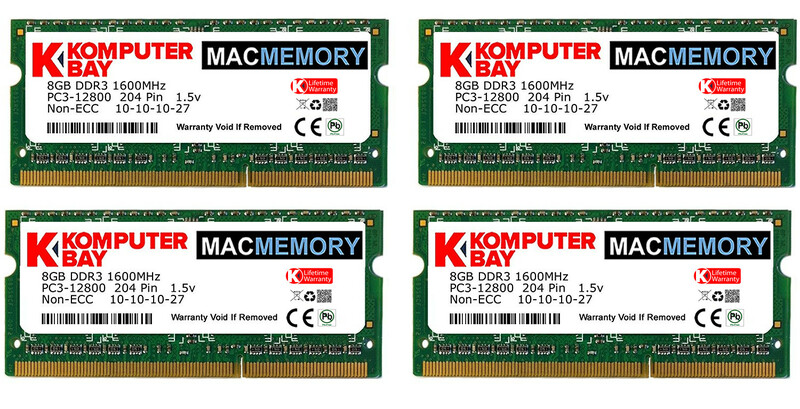 Bought this RAM kit for my late 2011 MacBook Pro 13" base model (2.4ghz i5, 4gb ram model). Installed real easy, took 5 minutes and booted straight in to OS X. Mac reports 16gb available and running at 1600MHz. Shared Video memory also increased to 512MB, the max currently possible on this model. Carried out Apple Hardware test and both modules passed 100% with 0 errors. So far very satisfied with performance boost, especially under heavier photo editing using LightRoom and Photoshop CS6. I have not noticed any additional heat or change in battery life since installing this kit. Small issue with purchase fee but seller resolved this very quickly and with zero hassle. Simple to install and then sits there just making the machine better. Well packaged, no problems to install and now my machine has probably more RAM than it needs but it runs so much better with this added to the base 8GB that it came with. There isn't a problem with having 2x4GB and 2x8GB in the two pairs of slots. So much cheaper here than getting it from Apple at purchase time and no difference in operation from what Apple would have used. The product is fantastic (my MacBook Pro is now bulgin with 16GB of RAM!!) and the service was impeccable and fast. I have a mac mini 2013 perfect working!!!! no problem at all. Replaced standard 2x2GB without a pair of 8GB 10-10-10-27 1.5V non mac sticks. Operation lasted almost 1 minute. Works perfectly with the Mini.